While at church today I was talking to someone who had never read the history of the Madison Pilgrim Holiness Church building (some call the Fulton School) or the area in which the building sits, at the corner of Ferry Street and Park Avenue, in Madison, Indiana. As the woman spoke about what she read recently, she also mentioned having read information about which I was at odds. I realized where she had read the inconsistent facts and decided it was time to make corrections publicly, although I do so with some reticence. Inasmuch as I do not want to detract from a book written by a beloved local woman who passed from this life just as her book was being released last year (2012), I have to make corrections because whether one considers the book historical fiction or nonfiction, with no disclaimer written when the book was published, and since some of the facts for this particular book credits findings on my web blog, I feel the corrections are in order. It has been a year since the book was published and I was unaware of the inconsistencies until I received my book in the mail, shortly after the death of the author of the book, Virginia Dyer Jorgensen of Madison, Indiana. The publisher of the book, “Ghosts of Madison, Indiana”, was made aware of the difference. Correction #1 is geographical. The street name change to Park Avenue from Sering Street occurs at East Second Street, not Fulton. At where maps show the corporation line the street’s name again changes from Park Avenue to SR 56. Regarding correction #2, people generally “referred” to the area past Ferry Street as Fulton, though only a section of this area of Madison had previously been the actual town of Fulton, according to plat maps I have seen at the courthouse. This map might help, although the actual northern boundary most closely follows the Lawrenceburgh and the dotted boundary line seen on the map and goes to the river, at the bottom of the map. 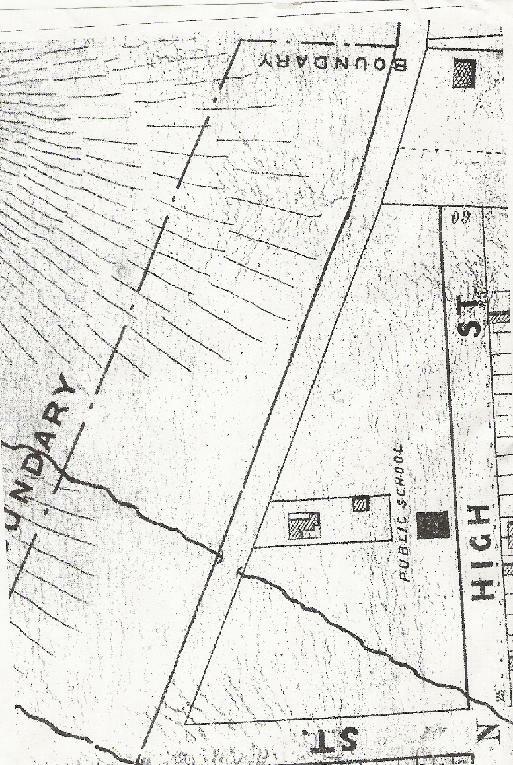 In regard to correction #3, the area just east of Ferry Street (which some called Fulton) was platted in 1835 . 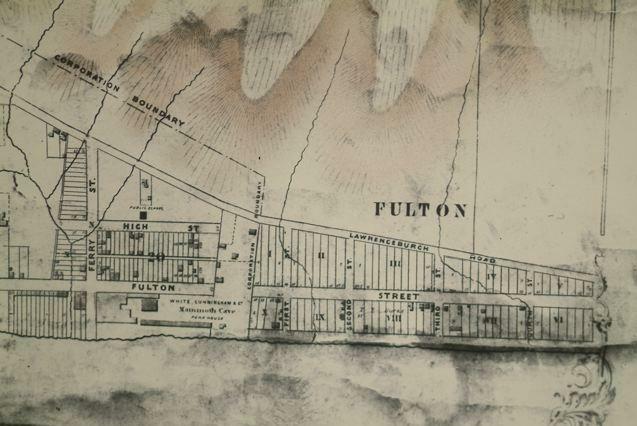 The Town of Fulton itself is farther east and was platted and annexed to the city of Madison in July of 1844, according to the documentation I have seen. I have not seen the recorded deed on the particular property mentioned at 1001 Park Avenue. The name change listed as correction #4 may just be a matter of not being able to read hand writing or making the inference from the longer name Heilman, who also lived in the house. Ginger misspelled Henry and Daisy’s last name as “Heil”. The correct spelling is “Kriel” though it has also been written in the past as “Kreil.” The spelling “Kriel” is preferred because that is how it appears on the headstones of family members. Correction #5, and also #6, is necessary because the Kriels had a second child, named Gilbert, so the change from only child has to be made in more than one place. Unsure as of this date if there were other pregnancies after Gilbert’s birth. The stillborn infant, Mary, was her first but not her only child. She incorrectly read data somehow from my website. “1001 Park Avenue Mary Brushfield Kriel’s son, Henry, was listed there with a wife, Daisey/Daisy Greusling, in 1892. They had a child, Mary Kreil (sp), who died at or near-after birth, on August 7, 1892, the death reported on August 9, 1892. 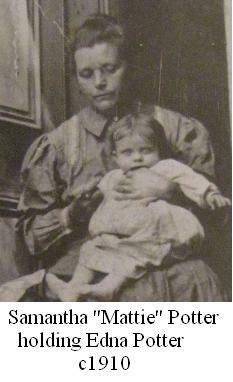 The online obstetrician’s record (Townsend Obstetrician Records) has “Henry (age 20) & Dora Greisling (age 22) Kreil. Aug. 7, 1892 (1st child) 1001 Park Ave”. The information I posted came from various sources, one of which was the Jefferson County Public Library in Madison. Daisy married Henry C. Kriel on 10 May 1892 and had a son, Gilbert N. Kriel. She died on 30 July 1903 in Indianapolis, Marion Co., IN and is buried at the Crown Hill Cemetery there. The information I gave the author somehow changed between my meeting with her and my seeing the written pages. I can only make corrections publicly and hope people make that realization. I too, have been known to make mistakes, but do not wish to further any that can easily be made known. 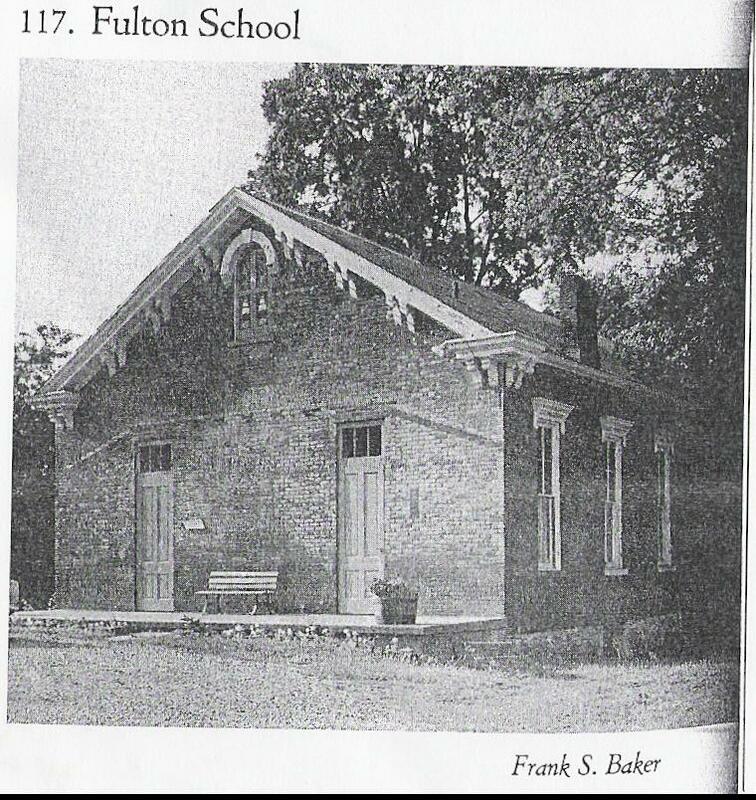 At the corner of Ferry Street and Park Avenue in Madison, Indiana stands a brick building which was many refer to as the Fulton School. I noticed this same photo in Madison’s 175th Anniversary, 1809-1984, but unfortunately, the blurb that went with the school photos mentions 1850’s schools, and the building shown as the Fulton School was not there in the 1850’s. It is the second Fulton school building in the neighborhood east of Ferry Street. The earlier public school building was on E. First, then High Street; that building still exists. The people in the neighborhood know the difference. 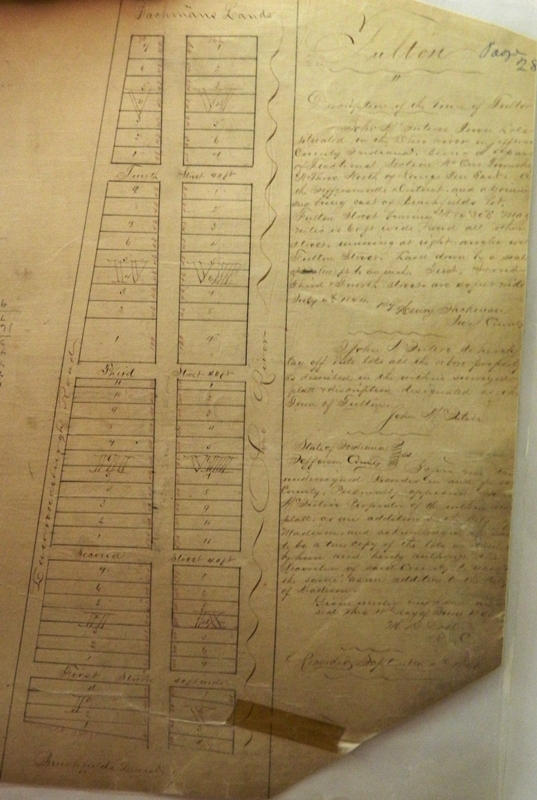 The difference becomes evident when you look at the 1854 map, part of which is shown here, which clearly shows a public school building further east and south of the building at the corner of Ferry Street and Park Avenue (in the photo above). See listing for 1011 E. First for the older school building. 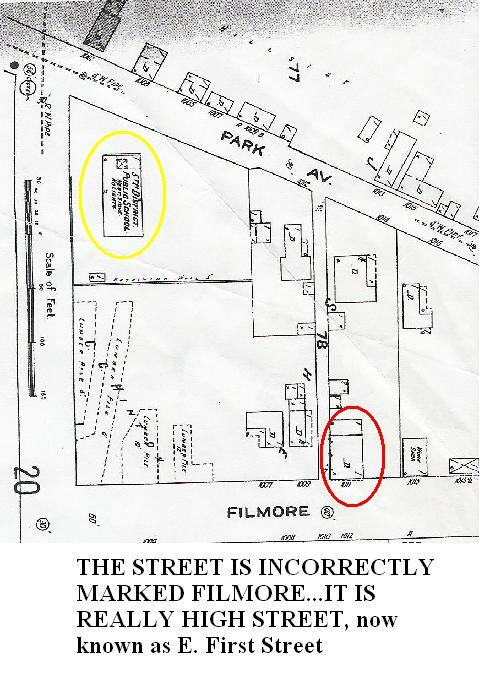 This 1911 Sanborn map shows both buildings, though the street name Filmore is incorrect. The red circled building is the older building. Yes,the building most think of as the school was a Fulton school, but not the only one, nor the earliest one. I didn’t want that to be another lost neighborhood fact. 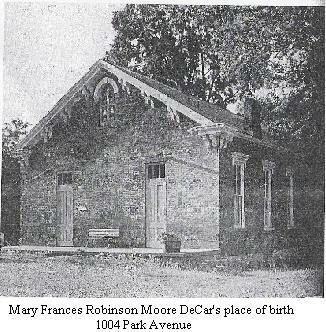 The building located at 1004 Park is currently owned by the church I attend, the Madison Pilgrim Holiness Church, with attendees coming from both sides of the river. I don’t have much information yet on this building other than that many in the neighborhood called it the Potter House, so I’ll work on it. I remember when the ancient tree just west of the building was hit by lightning and fell to the ground just clipping the southwest corner of the building, damaging the cornice, and now a new copperwork cornice has replaced that which was damaged. **NEW INFORMATION as of April 16, 2013! BUILDING~ Brick, built in 1875. One story, two rooms. Insufficiently and improperly lighted, heated by stoves, no ventilating shafts. Entrance is through an un-warmed vestibule where wraps are kept. The photo on the left is one I took of a recorded plat found at the Jefferson County Courthouse, showing the Town of Fulton, an addition to the city of Madison, Indiana, as having been properly surveyed in 1844 and recorded as an addition on September 4, 1846. The area east of Ferry Street in Madison, Indiana has been referred to as Fulton, east Madison, or just part of Jefferson County’s Madison Township. But, according to that which is on file at the Jefferson County Courthouse, I WOULD think it should be considered an addition to the city and shown to be within the city limits…at least that is how I read it. The Town of Fulton (not Fulton county) is an addition to the city of Madison, but, for some reason, it does not show up on maps as being within the corporation limits. I realize it is difficult to refute 160-plus years of map drawing, but it is something I have taken upon myself to find out about and correct if possible. First, I had to show someone that the original plat existed. I chose to start with the man who would change the map, if, as he put it, “Someone bigger than me needs to tell me to change it.” Fine, I will write enough history that someone bigger than him has to tell him to change the map. After my conversation with him, I walked him to the courthouse, had someone print out the John Marsh Add to Fulton and the Town of Fulton ADD to the city, and he took those with him. Step one. 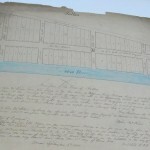 Up to this point, I only had photographed a lovely hand-drawn copy of this addition, complete with a colorful blue Ohio River, on file at the Jefferson County Historical Society. I thought it was much more exciting than the yellowed and now laminated original I had waited to see since the courthouse fire and return of cleaned documents. 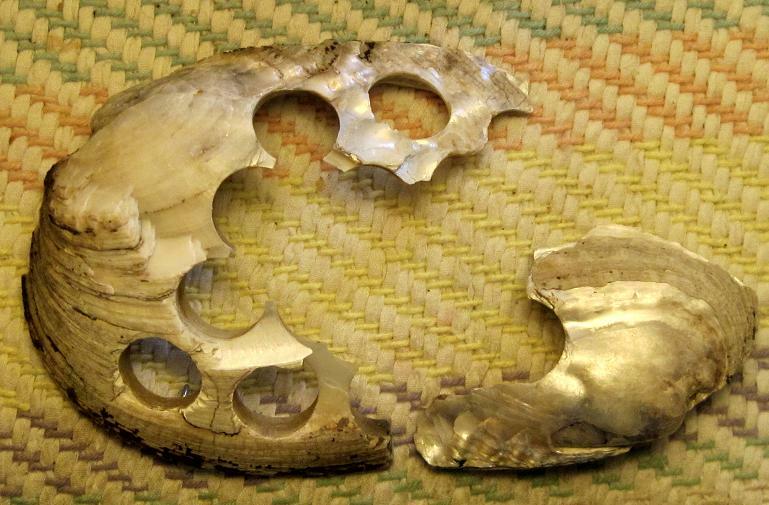 I photographed the copy a few years ago when I first began my research. Pardon my disappearance for a few years, but I am back and itching for the truth to be known. Follow me as I try to put history’s facts where others would rather I wouldn’t…where they have to be noticed and this area can no longer be ignored. This was just a reminder that I am still doing research and now that the courthouse documents are back where they belong, I will be flipping through many more pages, taking more photos, and writing history about a place forgotten to the history of this town. This is no easy feat but I do have a serious habit of finding things no one else knows is missing. I’m sure you wonder how that could be, but it takes a certain amount of awareness to notice things are changed. My curiosity leads me to tenacious exploration and discovery, all in the name of Truth. I started another blog, just about Fulton, but the thing acted up, and I need help fixing things, so I am doing some posting here, now that I am re-energized. The other working page for Fulton is at fultonhistory.wordpress.com. Thanks for stopping by. 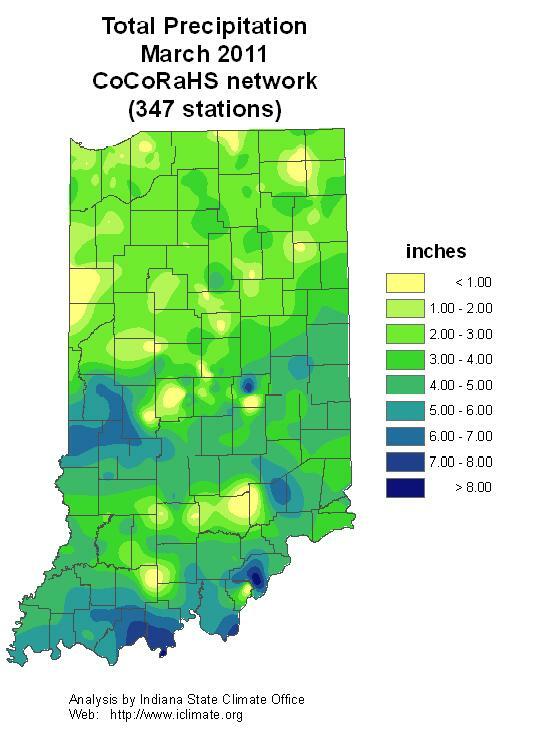 In February, the state average precipitation total was 4.17 inches, which is 2.28 inches above normal or about 183% of normal, the 8th wettest February on record in Indiana. 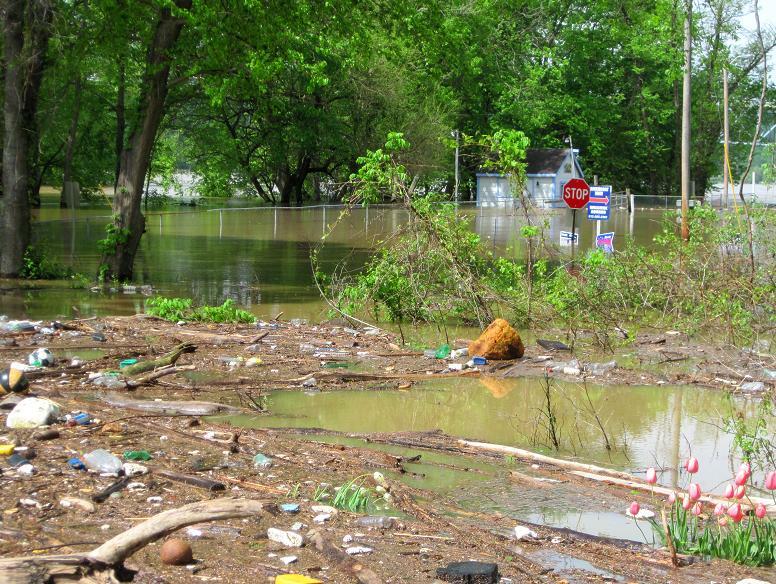 Then March came along, and there were areas where flooding began to rear its ugly head. The state average precipitation total in March was 3.50 inches which is just 3% or 0.10 inch above normal. 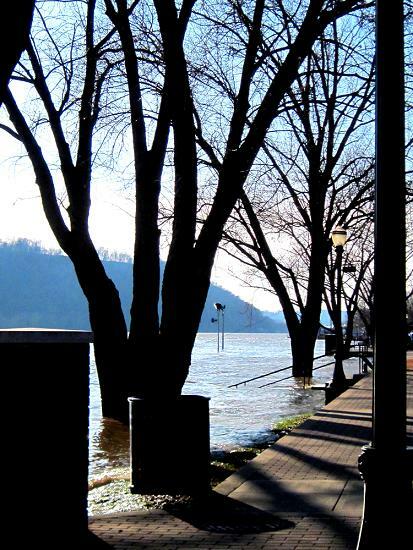 Madison had some flooding downtown along the riverfront on Vaughn Road, which proved to be somewhat a curiosity for local shutter bugs, myself included. 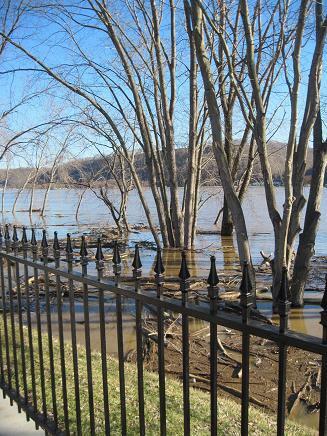 This photo, looking through the riverfront fencing, is the west of Vaughn Road, in early March flooding, which was mostly just to the sidewalks. 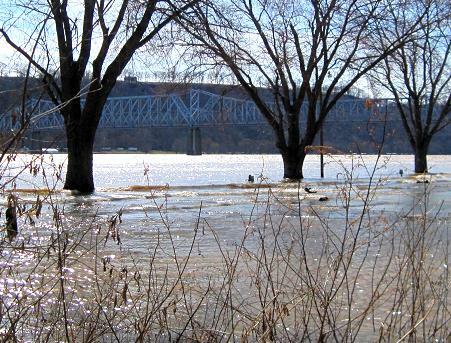 Behind the house, I took a photo on March 10th that showed the waters rising and one on the other end (west) of Vaughn. 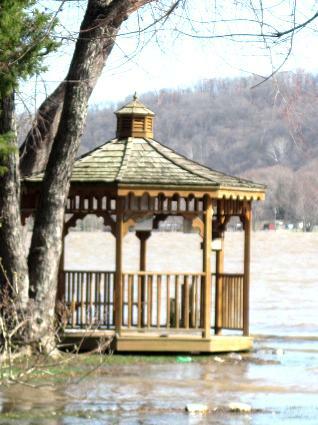 The next day I took a photo of the city’s campground gazebo which was still surrounded by water. 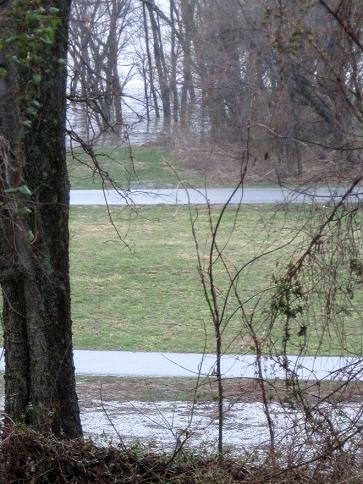 The treeline in another photo showed the flooding had covered the campground parking lot. 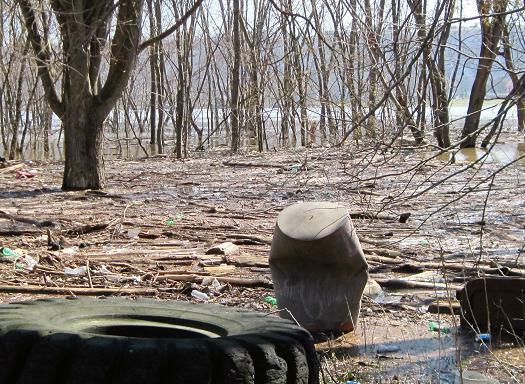 Another photo shows the trash beginning to collect in the woods (taken March 12th). 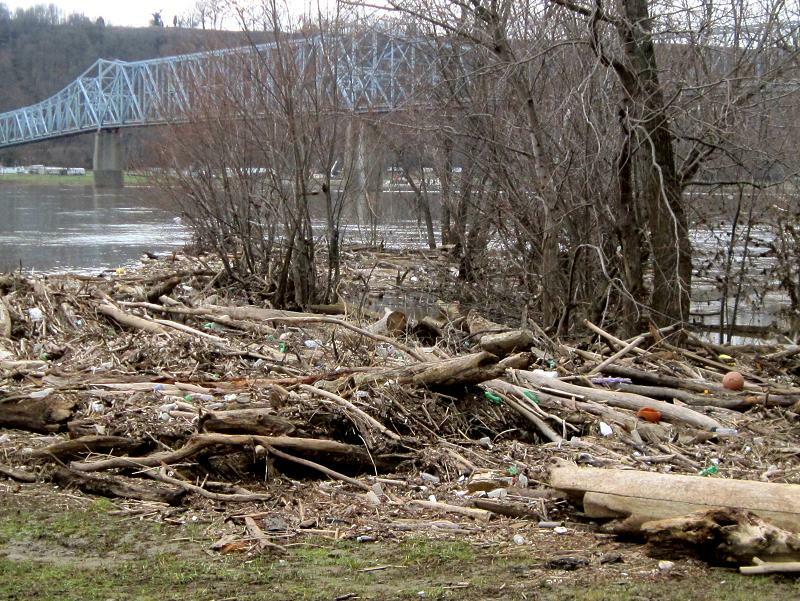 By the 20th the river had gone down some but left behind log jams all along the riverbank. On April 19, 2011 26 tornadoes hit statewide, not far behind the 37 tornadoes recorded on a single day on 2 June 1990. Tornadic weather continued through April. 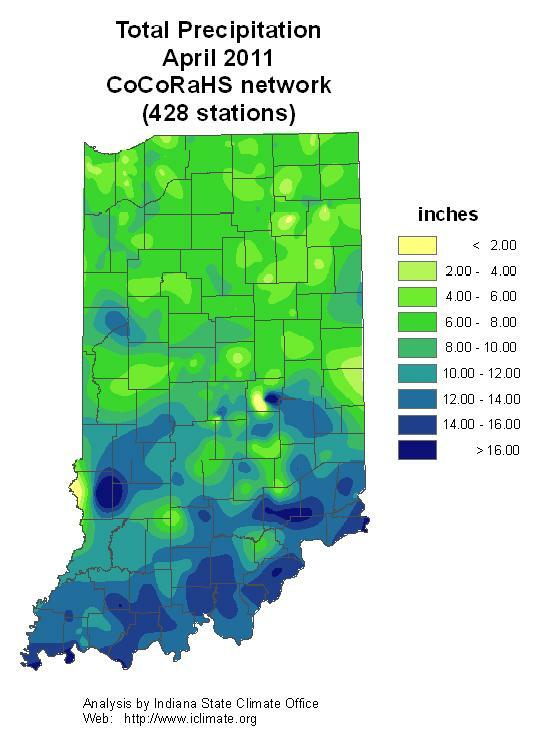 The state average precipitation total of 9.69 inches ranked April 2011 as the wettest April on record in Indiana. 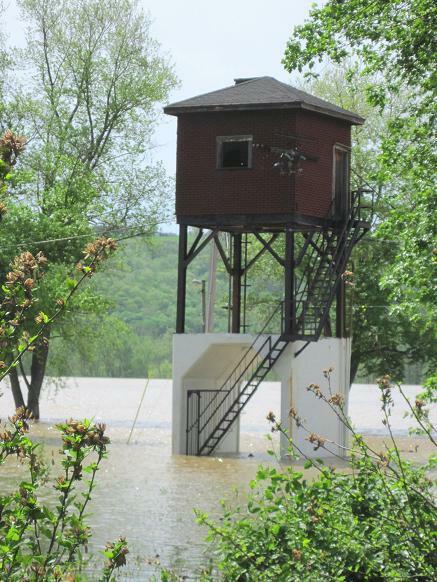 This total easily surpasses the 7.01 inches in 1947, the second wettest April on record. Flooding will attest to that, and not just here. 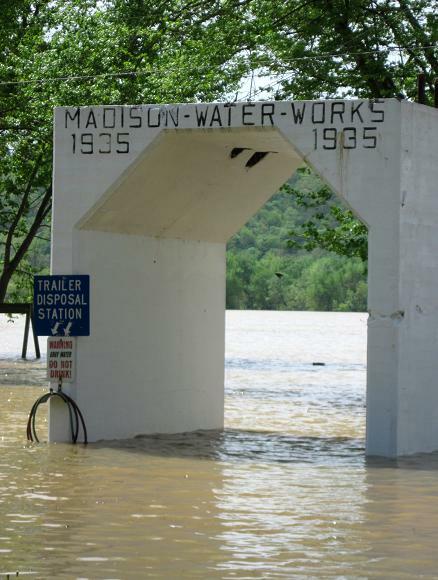 It marked the beginning of the domino effect, since all that water went south, creating record flooding all along the Mississippi River in May, 2011. April 26th I walked a little out back, on the east Vaughn area, taking a few photos, for the record. 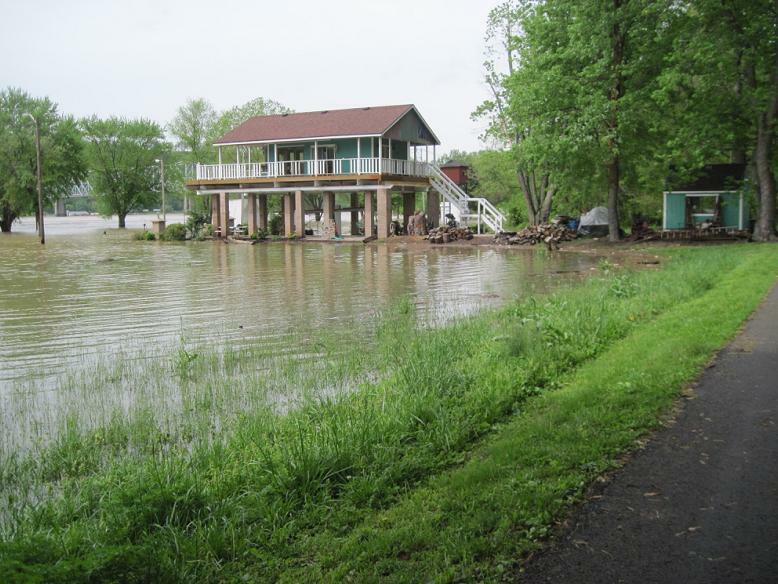 A house on stilts, the only one of its kind in Madison, is safe from the flooding that closed Vaughn Road. At the end of Ferry Street the road was impassable due to high water. By that time, the water covered all of Vaughn Road west of that location. The old water tower (electrical shack) is the last to remain though there are still a couple of the concrete bases still standing. The photos I took of the Ferry to Fulton area in April and May are nothing in comparison to flooding that occurred in parts south. 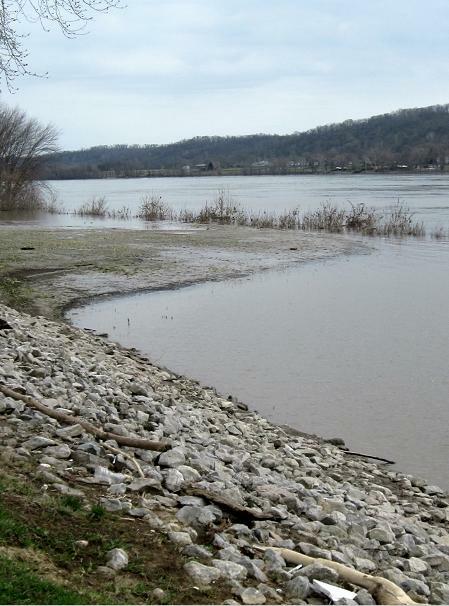 This photo, taken May 6th showed the river had gone down again here, while it kicked into high gear as it flowed further south. The Fulton area, which apparently encompassed more than the official area annexed to the city of Madison, was commonly called “Pottersville” at one point in history, according to those “in the know” in Madison. Neighbors frequently referred to the area as Pottersville because of the large number of family members by that name. Things being what they were, it seems almost everyone in this section of town was somehow related to a Potter, even the Brushfields (the family that first caused me to start this blog) were related by marriage. Because of my research I was honored to meet and talk with the great-great-granddaughter of William and Mary Potter from Delaware, one of those early pioneer families in the area. Mary DeCar is the starting point for information in this post. A second interview is definitely in order. Little did I know, Mary DeCar, one of the women who works at the local JayCee Grocery, where I generally shop downtown, is also the wife of a local steamboat historian, Mr. Louis DeCar, who has given many presentations about steamboats in the local schools. I have used a couple of quotes about part of Madison’s history as Mr. DeCar told it. I include a little information on Mr. DeCar at the end of this post. Although we cannot positively identify who’s who in this photo, we can start with the presumption that they are related. I was told the photo contained “original Potter brothers”. 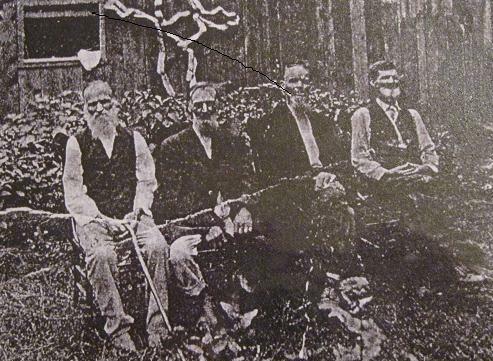 The history rescue project’s mortality lists of 1850-1880 censuses listed a John Potter, age 66, from Delaware, as deceased, October 1870, so he may have been gone by the time this photo was taken. Mr. DeCar seemed to think one in the photo was John Potter, Mary’s great-grandfather, John Potter, who showed up as being alive on the census, shown in a link below. Who knows. Maybe other photos will someday reveal who’s who. I do think the shantyboat house is what I see in the background. 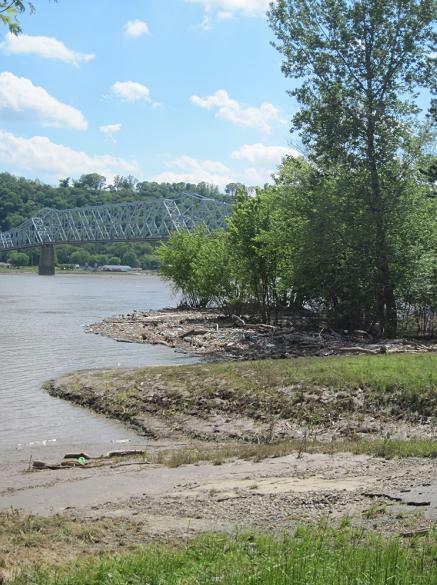 No doubt, some structures were there before the Potters came to the area, but anything built in Fulton proper, before 1937, was washed away in Ohio River floods. 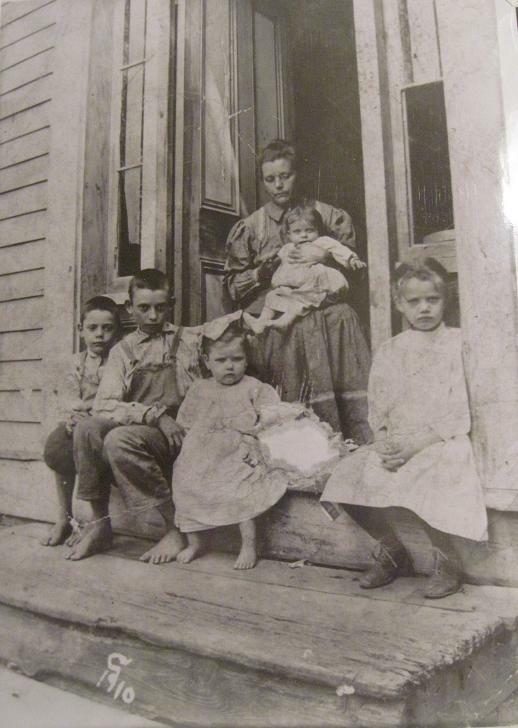 The “hint” of a building is shown in a photo of Mary’s grandmother (Samantha/Mattie) with children. Virginia, her mother, is the child at the right in photo (see enlarged). Mrs. DeCar said (about this photo) “That’s the home that went away in the ’37 flood. That’s my grandmother, that’s my mom, that’s Aunt Laurie, that’s Commodore and Bailey that is Ednie, the other girl.” The photo was marked c1910; the flood that took the house was the 1937 flood. If anything was on the part of Fulton closest to the river, it’s gone. In checking the 1835 date for the Potters settling in the area, I came across the death notice for John Potter, son of William and Mary Potter, one of those original (Potter) pioneers in Madison’s Fulton area. The death notice (1835-1922) stated the family came to Madison when John Potter was 9 months old. The 1920 census shows John Potter, age 85, living with a 20-year old boarder, next door to the William Potter family on one side and the James Potter family on the other side. The Tommy Gibbs family (a family who Mrs. DeCar says in whose house her aunt once lived) was nearby in the mix of Potter families on Brooksburg Road (now State Route 56) and Fulton Street. I still haven’t been able to access any deed records for Fulton and realize that will be difficult. One neighbor told me he has a copy of his, so that will help. I will get around to these at some point. Records are still not complete in the recorder’s office since the courthouse fire, but then, Fulton records may not have ever been part of those. Where was I? Oh yeah, back to Mr. Potter.The death notice for John Potter, found in the Madison Courier, dated April 21, 1922, stated that Mr. Potter was “one of the best known citizens of the east end and the last of the original Potter brothers of pioneer river days,” further describing that Mr. Potter’s passing, due to Bright’s disease, had occurred at 5:50 in the morning, “at his home in Fulton, thelittle settlement adjoining the Madison corporation line on the east, which the family had practically built and made for more than half a century.” The notice stated that Mr. John Potter, Esq, was the “last of a sturdy race, the decedent lived to a hardy old age (87) and was active” up to a recent time near his death. He was the last of the “original Potter family” that settled in Fulton, somewhere east of Ferry Street, in Madison, Indiana. As previously alluded, Mary’smaternal grandparents were “Pud” John (25 Jan 1863 – 24 Sep 1948) and Samantha (also known as Mattie) Potter (10 Dec 1867 – 17 Jul 1936) of Madison, Indiana. 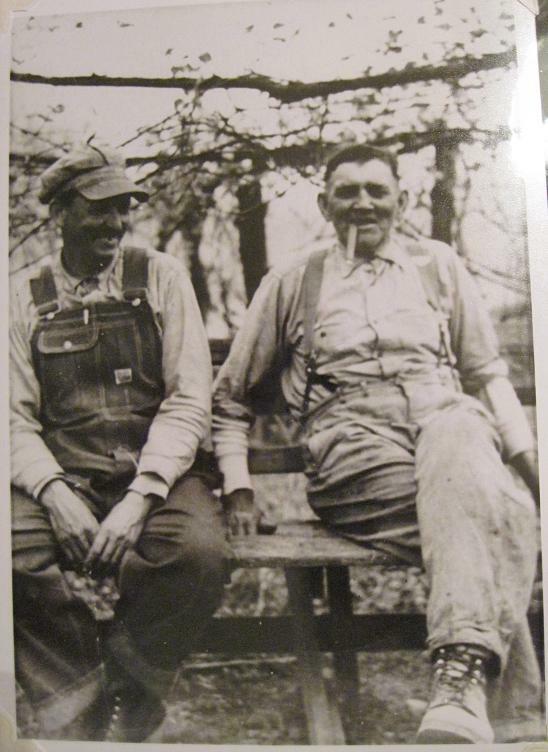 “Pud”, as he was affectionately known, called his wife “Maddie” or “Mattie” because she was often upset with him about staying late and drinking at a relative’s shantyboat up on logs in Fulton. There is a house in Fulton that was built atop the shantyboat, but I am not sure yet if that was theirs. Mary added that her grandmother was not the only one who had a husband that frequented the shantyboat too many times. Sounds like I need to do more research for another post. Looking through the local library’s history rescue project, I found two of the birth records listed for two of John and Samantha’s children. I noticed John’s middle name was different in the listing, but believe them to be the same person. 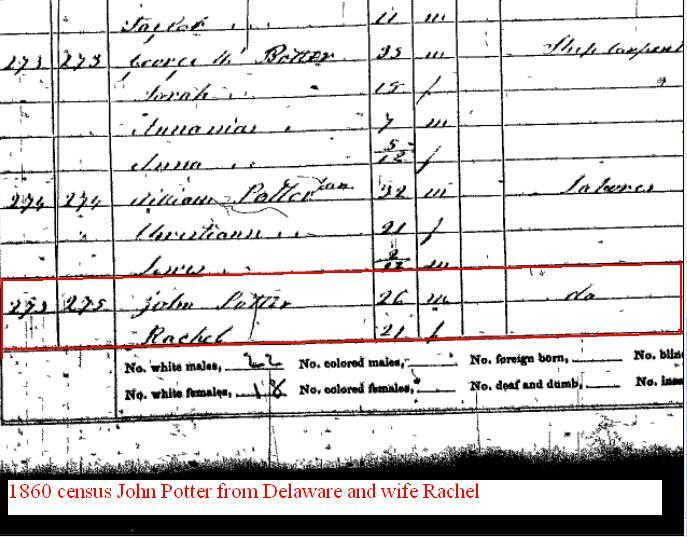 The 1900 census listed John and SamanthaPotter minus one child, leaving Commodore as the only child at that point. The 1920 census showed John and Samantha Potter living on Brooksburg Road, also known as State Route 56 in Madison, Indiana, with five children, one of whom was Virginia Potter, Mary’s mother. Neither parent was listed as being employed at the time of this census but Commodore Potter was employed as a button cutter at the Melish Button Factory. Teenaged Virginia and brother (Daily or Bailey on records) worked at the Cotton Mill at that time. Mr. and Mrs. DeCar had a photo of Commodore (shown above on the left) with “Pud”. Mary told me that Commodore was deaf due to a “bug” in his ear as a child. Commodore is also shown in a few other family photos. I found he had a distinct look about him, which usually made him easy for me to find in the other photos, even those without markings. 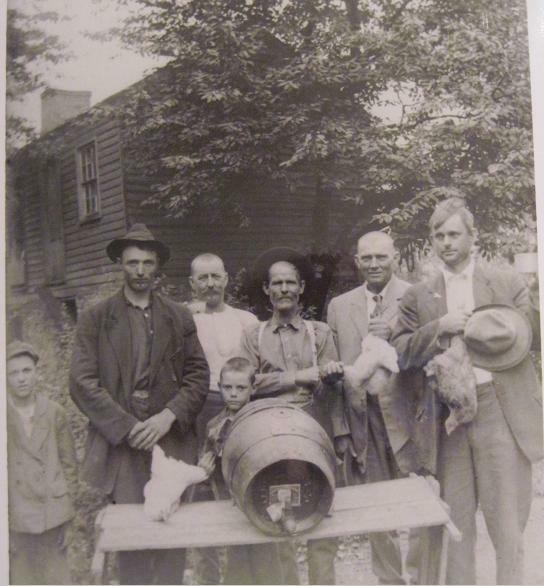 We can assume the barrel contained some of their favorite neighborhood brew. The house in the background appears to be the one that still stands on Filmore (sign now says Fillmore as of 2013) Street, mentioned in my post Bertha’s Bevy. Maybe it was the day they put the addition on the house, who knows. A great photo of the Potter Button Factory, as it was known, can be found in my post, Button, Button. It would seem it was operated out of a frame house on Park Avenue. Part of a newspaper account about the factory is mentioned in the aforementioned post. Another photo worth mentioning is one which showed nearly all the men in the neighborhood at the time the photo was taken. 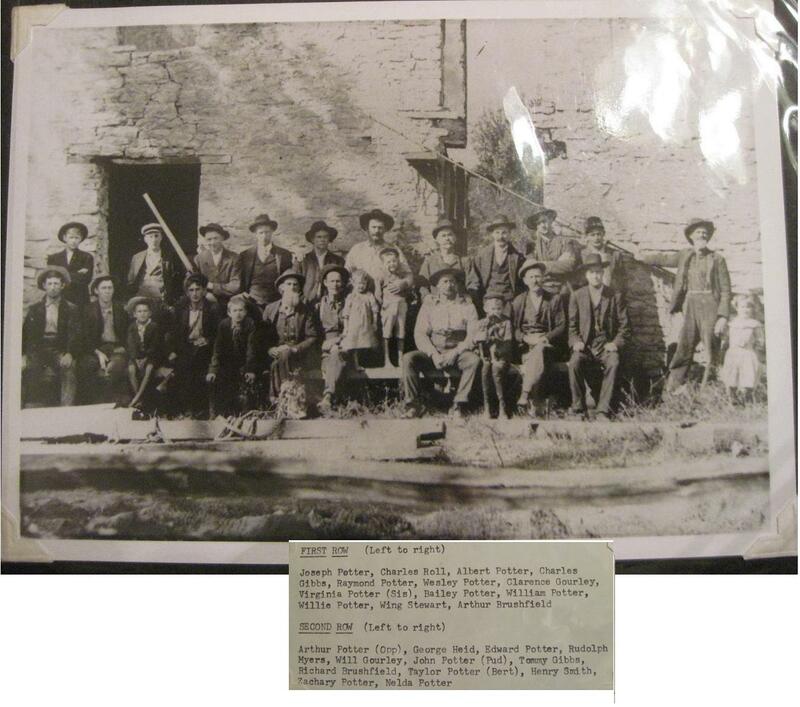 The building, one of many stone houses built in the area, is long gone of course, and fortunately, this priceless photo remains, showing the names of those included in the photo. Before I get too far off on the family, which proves I need more than one post about Potters, let’s get back to Mary Frances Robinson Potter DeCar. 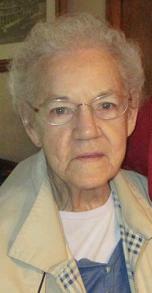 Mrs. DeCar, Mary, is the second eldest of 10 children. At the time I posted this, I had not confirmed her birthdate, but she’s the daughter of Charles (29 Jun 1896 – 27 Nov 1976) and Virginia (Potter) Robinson (27 Mar 1903 or 1904- 18 Jul 1990. Mary’s parents were married April 21, 1923, in Trimble County, Kentucky. They lived at 1004 Park Avenue when Mary was born. M ary and her older brother were both born there. Mary told me,“They (her parents) were in the upper half, and the side next to Ferry Street were the Potters, Bert (Taylor) and Mame Potter. Out front they had a filling station in front of their side.” That would mean it was at the corner on the western side of the building on the Ferry Street side. I would think if there were any partial graves left (from the original cemetery there) they would have been destroyed by digging a spot for an underground storage tank. Anyway…I looked at the 1920 census which showed Taylor Potter and family living on Park Avenue. Mary volunteered that across the street from where she was born, at the Heilman house, she, on occasion, drank from the cement trough because the water was always cool. She drank from it until she found out it was a horse trough. When I asked about other houses she remembered, Mary told me her aunt and uncle lived in the Gourley house “They had a barn, he had two cows, he had the horse, he had bees, I don’t know what else.” I asked if that was Wesley, and she said, No, It was Arthur.” They called him Opp. At one end of the house that way he had a garage, cause he was a mechanic, and THIS end they had a building built and it was, they had gasoline pumps in front of it, and you could buy soft drinks and bread or stuff like that. …It was right on the road. Yes, the Gourley house is one about which I will do a post when I interview Patrick Gourley, who says he has a deed to the property I can look over. A Gourley shows up in one or two of the photos she shared with me. I think we will just leave that one alone for now. It is obvious I need to do another post or two or more on the Potter family, but for now, I will try to bring this post back around to Mary and save the rest for another day. I did find an 1850 census listing for George and Sarah Robinson, who must be related to her father’s family, but I will connect those dots some other time. As I said, Mary Frances Robinson DeCar was the second of ten children. Mary said she was raised on Filmore, worked at the neighborhood grocery store, which was under two different owner during the time she worked there, next to Greiner’s Brewery at the corner of Ferry and Park. Mary married a man from another neighborhood family, John Henry Moore, Jr. Mr. Moore was her first husband. Mr. Moore. was the son of Bertha Sheets and John Henry Moore of Madison. 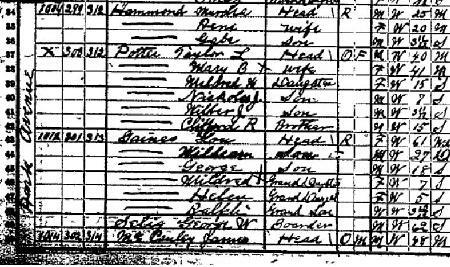 The 1920 census shows John H. Moore and wife Bertha on Filmore with seven children, one of whom was John H. Moore, Jr., born July 10, 1906 in Covington, Kentucky. An earlier census, from 1880, showed Henry Moore living on Filmore with his wife, Martha, two daughters and their son, John H. Moore, so the family owned the same property for quite a while. Another post ( Bertha’s Bevy ) gives a little more on the Sheets-Moore family. Mary was married to Mr. Moore until he died on Sept. 14, 1945. The Moores had one daughter, Nancy Ellen Moore Coghill, who was born September 19, 1945, just a few days after her father died. Unfortunately, Mrs. Coghill died a couple of years before this interview, on May 3, 2007. Nancy was raised by her mother and step-father, Louis DeCar. The DeCars met at Mary’s sister Polly’s wedding to Donnie Stewart, a man from another neighborhood family. The DeCars married July 3rd, 1955, so Mr. DeCar became step-father to Mary’s daughter, but the DeCars had no children together. I met Mr. DeCar when I was looking for information on the Potters and Robinsons of the east of Ferry area of Madison and figured I should mention him someplace in the post. Although I had a short interview with them both at their Madison hilltop home, Mr. DeCar gave me the mini-version of his usual schpiel, which I found interesting. I am sure he is a wealth of information about Madison in general, but my visit was mainly to get information about Mrs. DeCar’s connection to the Potters from the time period the area east of Ferry was referred to as Pottersville. He had drawn a little map of the neighborhood of who lived there in 1961, putting down the name Robinson at the address at which I now live. He also had some Potter genealogy as well as a couple of photos to show me. Louis DeCar was born in Madison, Indiana, to Swiss immigrant, Angelo Luigi DeCarlo (shortened to DeCar) and Helen Rector, a native Madisonian, on June 30, 1923. Angelo DeCar, who learned horticulture at the University of Milan, Italy, worked at the Madison State (Psychiatric) Hospital. Louis was born in the old John Hinz house on the hospital grounds. His father died in 1924, so Louis was raised alone by his mother. Louis DeCar graduated from Madison High School in 1941, served in World War II, lived and worked in Madison all of his life. He is an ardent fan and supporter of all things basketball and is a steamboat aficionado as well. He has given many talks to local schoolchildren about his memories of Madison. The DeCars told me there is a yearly Robinson-Potter reunion. Maybe I can get some more information from the next one. Golly! It’s been since September that I posted?!! Sorry folks. I AM working on it. Check out some older posts while I am working on another one. I recently interviewed a member of the Potter family for a post about the Ferry to Fulton area of Madison, Indiana, which was sometimes called Pottersville, due to the number of Potter family members in the neighborhood. 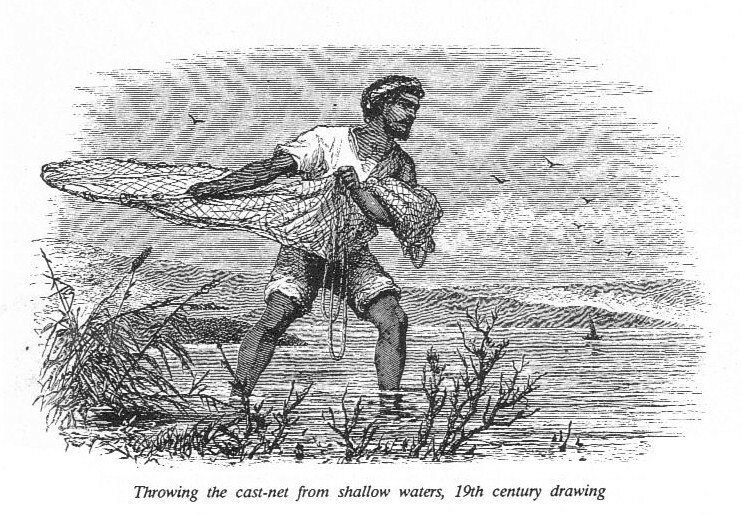 Even the Brushfields were related, so this could take a while. Actually, I have chosen one (LIVE!!) member of the family as a starting point. Look for a post soon, something with old photos, too. YEAH!!! More of my history blogs!